You may know it as the bathroom, restroom, water closet, WC, lu, or privy… but no matter what you call it, we all need one from time to time! 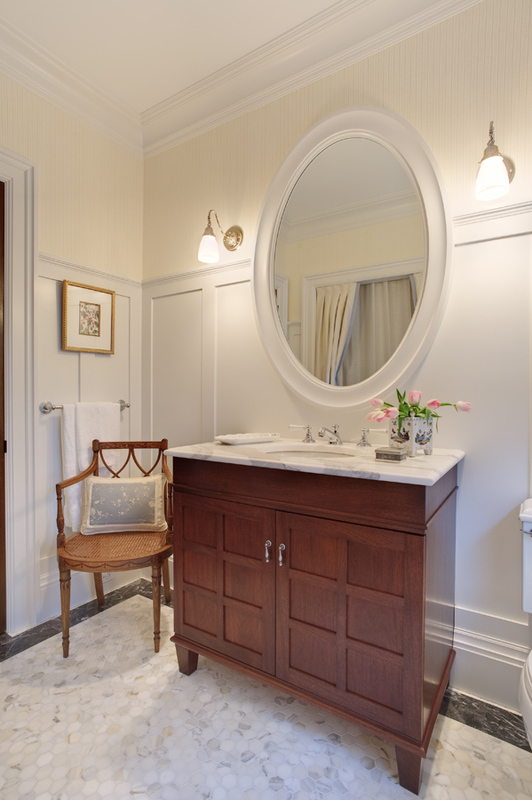 While the bathroom/restroom may be one of the most functional and potentially utilitarian rooms in your residential or commercial space, that doesn’t mean it can’t be beautiful too. Since moving indoors, there have been many advances in plumbing, and there are a variety of design opportunities to create character defining details and spaces of repose. Let’s take a look at flooring. 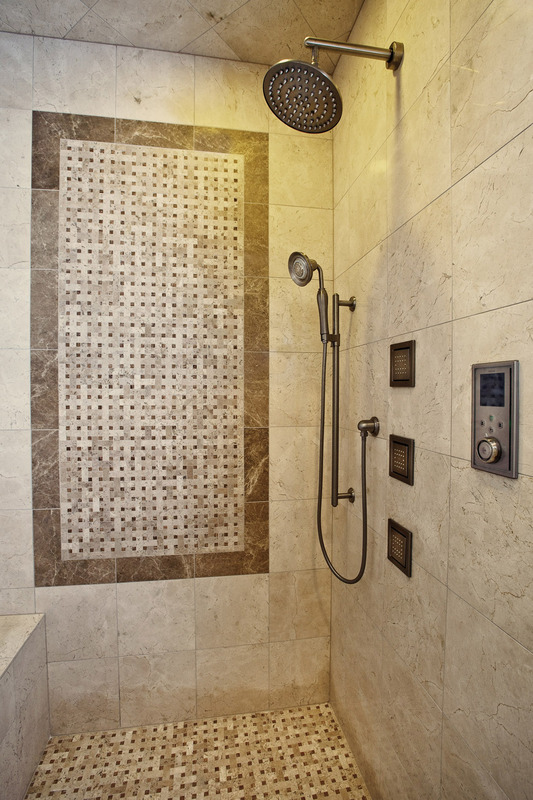 Use of large tiles can be problematic when it comes to sloping-to-drain. Consider installing a trench drain at one end with a decorative grate. This is especially useful for commercial projects that are subject to frequent and heavy cleaning. 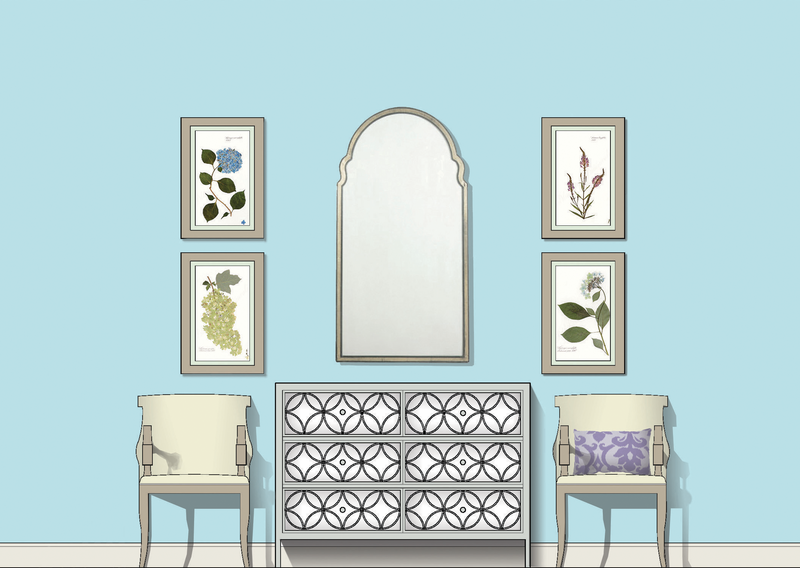 Walls present a variety of options including painted gypsum board, stained or painted wood wainscot, or decorative tile and accents. 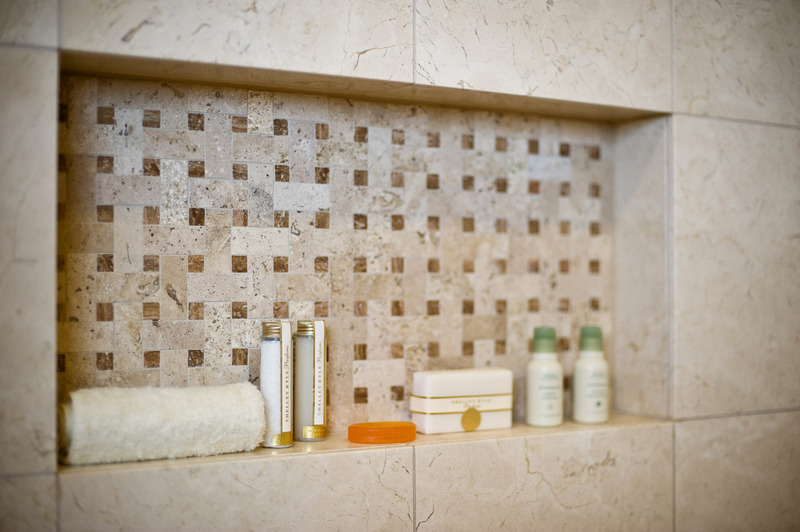 When niches are provided in shower walls, additional storage can be added. 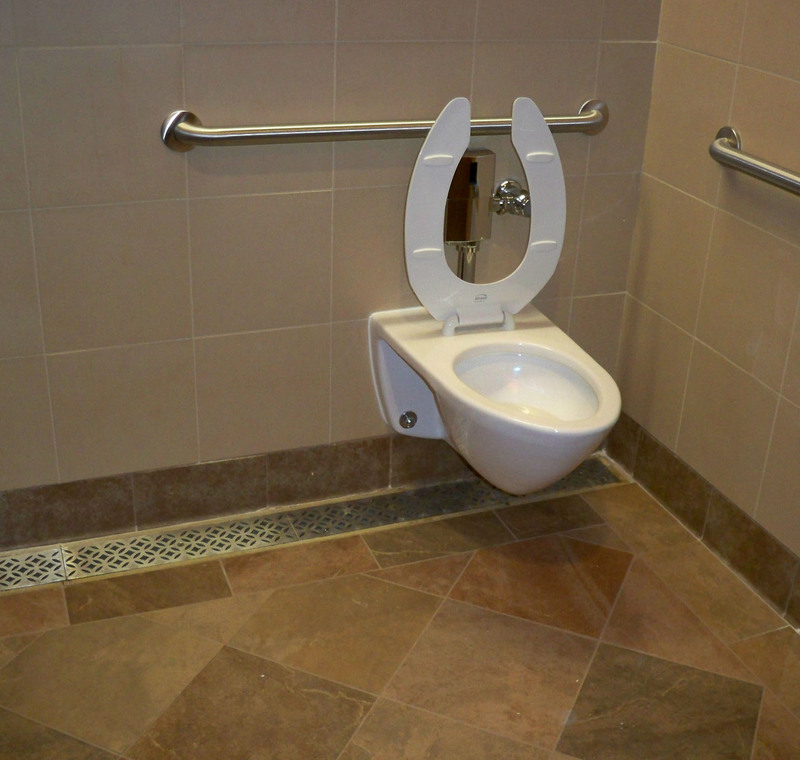 Toilet partitions are another opportunity to provide character. 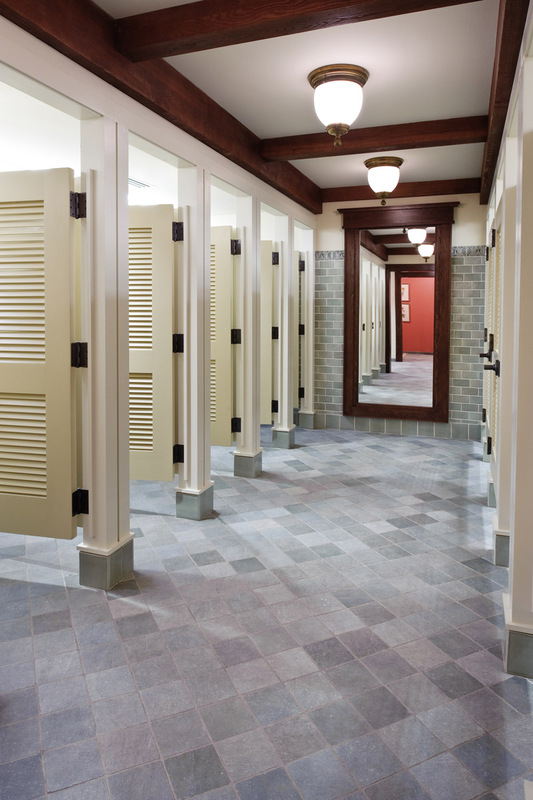 If the budget allows, consider wood or stone partitions rather than phenolic. 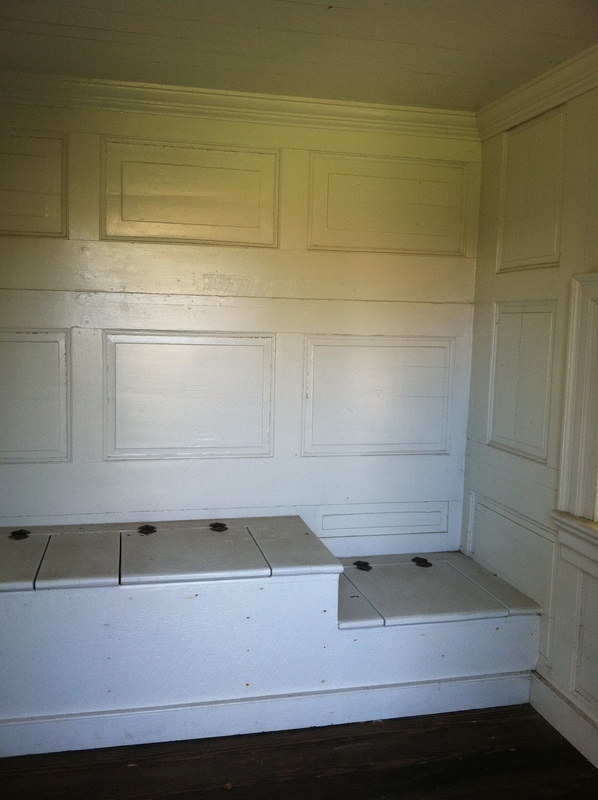 A row of toilet stalls can be enhanced with a bit of decorative trim work as well. 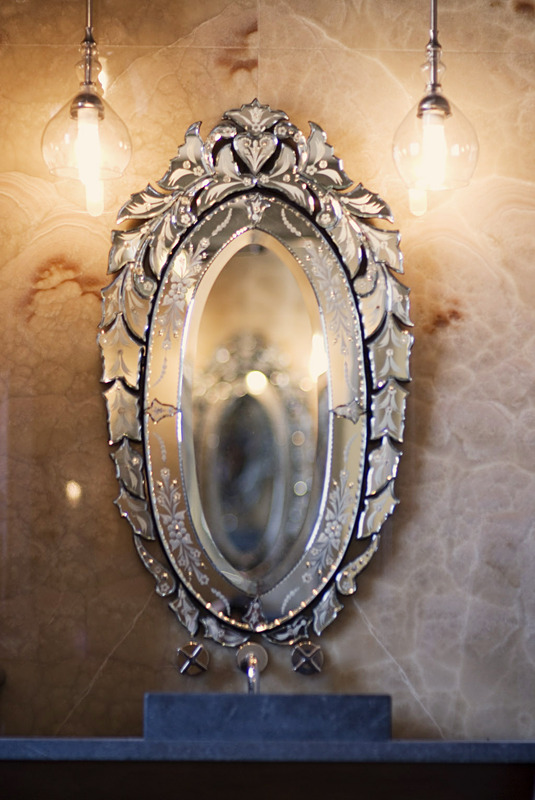 Consider a statement piece such as a large mirror with decorative trim or a beautiful stand-alone mirror. …Or a large scale stained wood console with stone countertop. 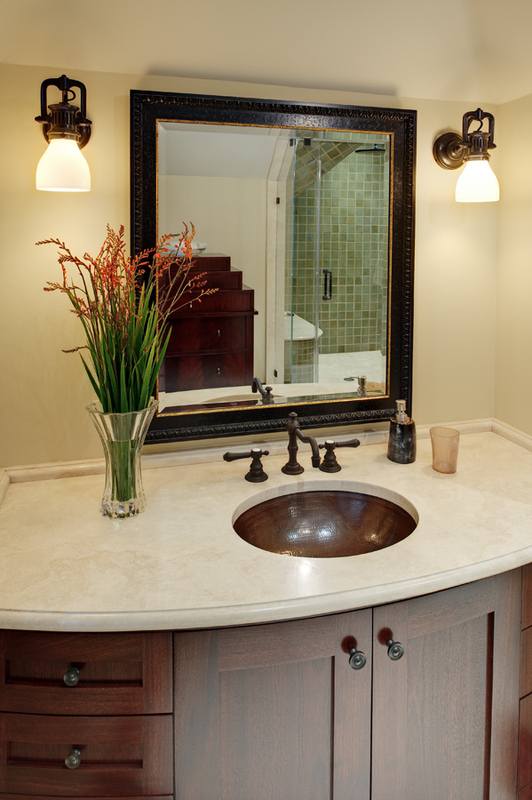 The same idea can be applied in a commercial setting as well, where a built-in vanity can appear to be a piece of furniture. Attention to detail can turn a utilitarian space into a memorable one, and maybe even one in which you choose to linger, spend some quiet time, or simply take in the view. There is opportunity for design in every living space. Glavé & Holmes Architecture is excited to be part of the Richmond Symphony Orchestra League’s Designer House. Our Hotel & Home Studio has been chosen to design the Master Bedroom at the Hampton Manor house in the Hallsley community. 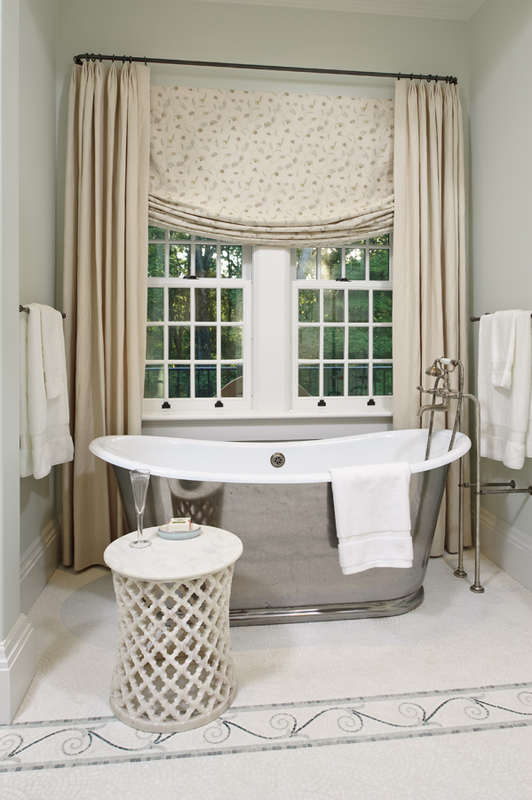 Gary Inman and his team envision a tranquil retreat in colors taken from nature, and luxurious textures to soothe and pamper its owners. While a sanctuary for Mom and Dad, it can easily transform into a Sunday morning “snuggery” for the children and beloved family pets. The transformation will begin in August, with the unveiling scheduled for September 15th. The house will be open to the public from September 15 to October 13, 2014. Be sure to follow us and watch as the room comes to life! For more information, visit rsol.org. Glavé & Holmes Architecture is honored to be named as one of the Top Interior Design Hospitality Firms for 2014 by NEWH Inc., the Hospitality Industry Network. This prestigious honor is determined by the chapter boards with consideration of a firm’s quality design work in the hospitality industry, along with membership and support the firm has provided to the NEWH chapter. Not only are firms acknowledged by their local community as a leader in hospitality design, they are also celebrated internationally across the vast network of professionals in the industry. 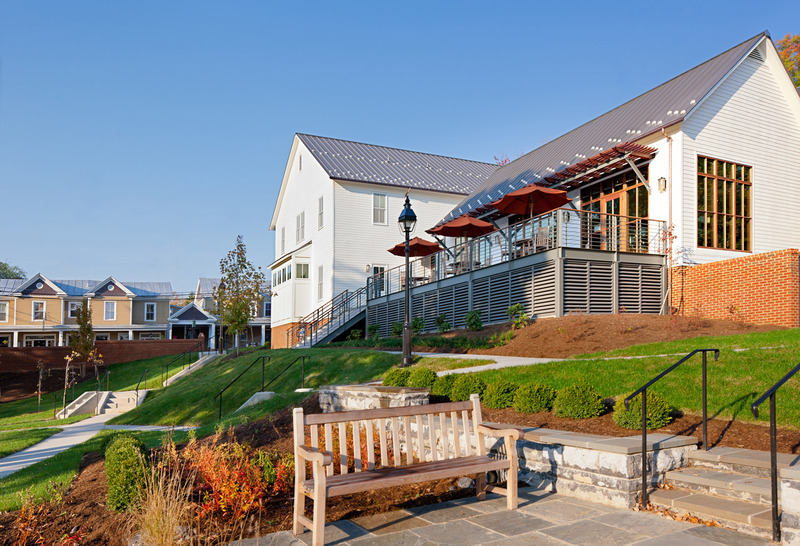 Glavé & Holmes was among two other firms from the Virginia Chapter to receive this award. 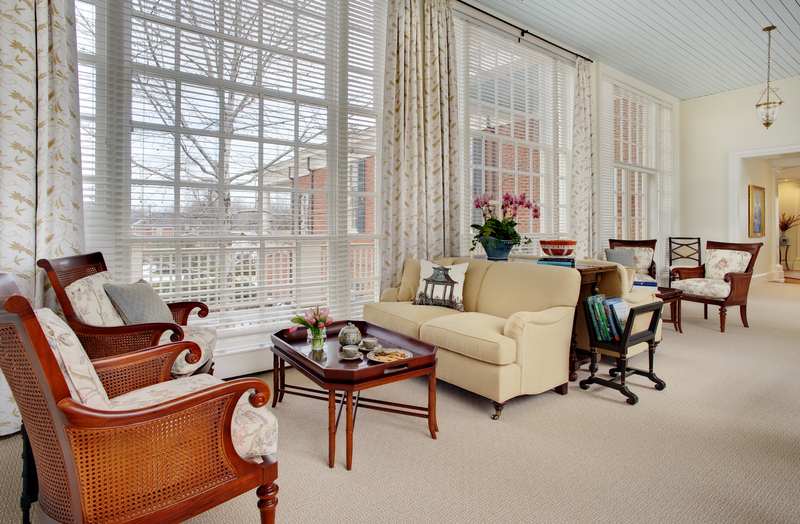 Glavé & Holmes has two solid decades of hospitality work at the highest levels of the industry. From historic resorts and hotels to restaurants, cafés, shops, and spas, the firm brings its contextual sensitivity to each project. 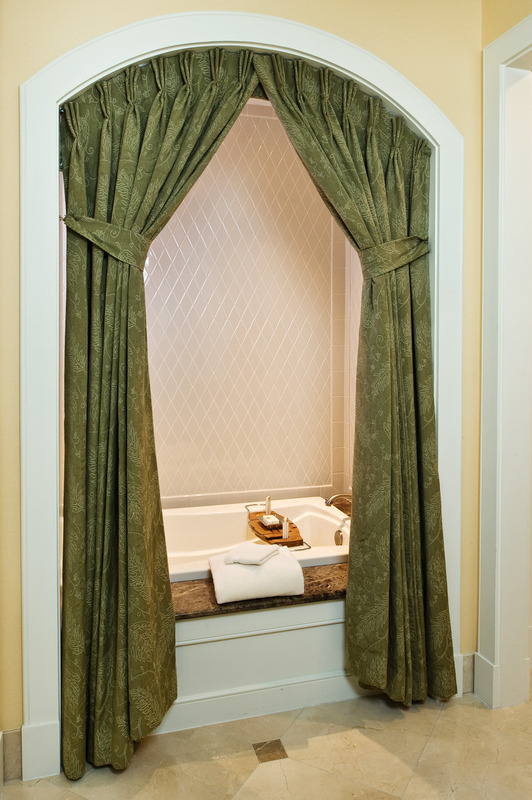 Whether it’s a National Trust site such as Pinehurst Resort, or a luxury spa as in Colonial Williamsburg, each is treated with the highest level of respect and care. The firm’s work for the hospitality industry seeks to entertain and nurture guests by providing them with an unparalleled experience. G&HA’s designers support clients by creating the stage for elegant events and fine dining. The team is guided by their unique contextual design approach, which requires a significant understanding of the history and culture of a site before developing designs. The design grows from the knowledge gained during this examination and assures that each design is as unique as the individual hotel, resort, spa, or restaurant. 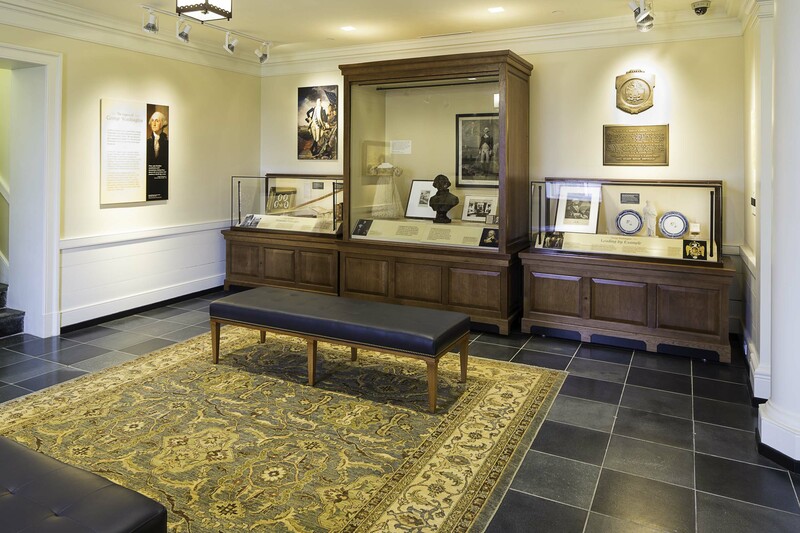 Glavé & Holmes Architecture is pleased to announce that our design for Washington Hall Exhibit at Washington and Lee University has won First Place in the Historic Preservation category of the 2013 Interior Design Excellence Awards. Listed on the National Register of Historic Places, Washington Hall (c. 1824) was known as “the Center Building”, an appellation referencing its central importance as much as its physical location in Washington and Lee’s historic Colonnade. Important administrative functions, including the offices of the President, Provost, and University Development, fill the 24,400 square feet of this elegant three-story building. Working within the confines of a historically significant lobby space while adhering to the Secretary of Interior Standards for Rehabilitation and LEED principles, the design sought to reconcile four main goals: (1) Create exhibit space used to educate people about and honor George Washington’s role in founding the university; (2) provide a beautiful and welcoming public lobby; (3) provide space honoring University benefactors; and (4) make sure students and faculty still felt comfortable using the space, thereby keeping it active and lively. 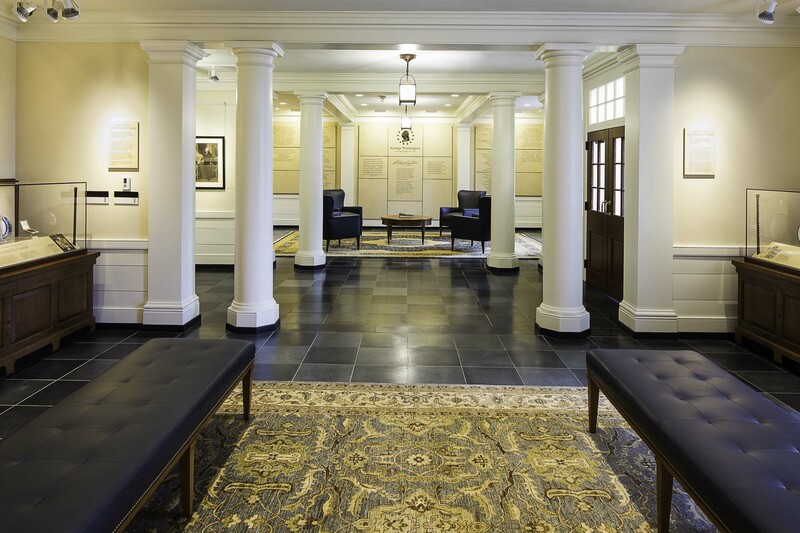 We are pleased to announce that our Interior Design Studio has received First Place in the LEED category of the 2012 ASID IDEA Awards for their work at Washington and Lee University’s Hillel House. Constructed in 2010, the Hillel House is located on Washington and Lee University’s campus in Lexington, Virginia. Washington and Lee University has a vibrant Hillel organization that, until recently, did not have a dedicated space to call home. 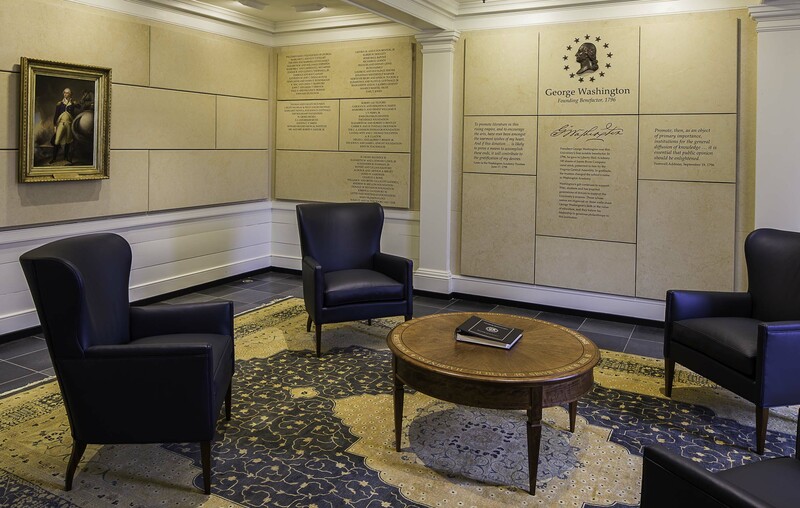 The University commissioned a building dedicated to Jewish student life to advance the University’s commitment to diversity. 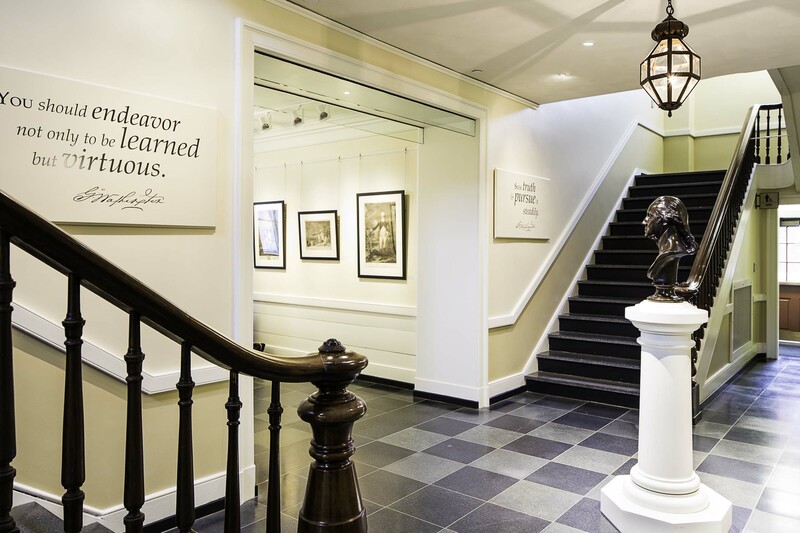 The facility’s purpose is to support the cultural and religious experience of Jewish students as well as welcoming Washington and Lee’s non-Jewish members. As part of the University’s commitment to sustainability, the building was designed to meet LEED standards and achieved a LEED certification in 2012. The primary goal was to create a building that serves as a home for the Hillel organization by providing a space to foster community. 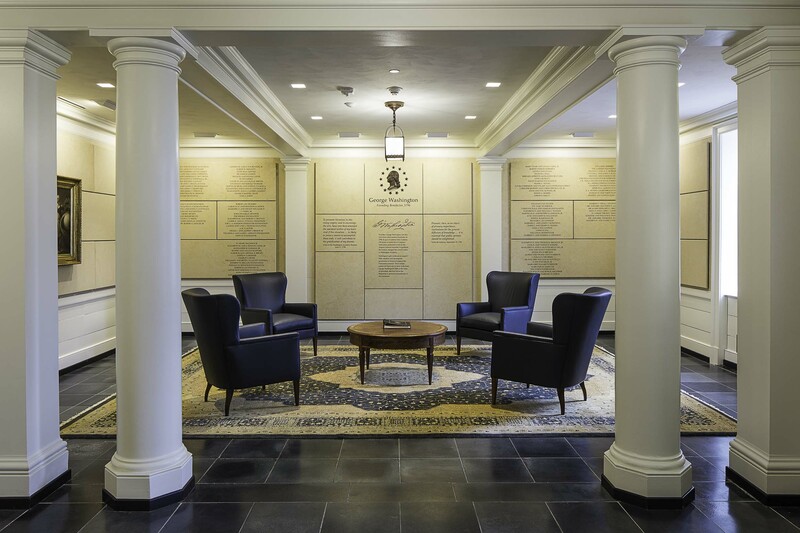 Since the University’s Hillel organization desired to welcome both Jewish and non-Jewish students to the facility, the design aspired to reference Jewish culture and religion in a non-literal way. 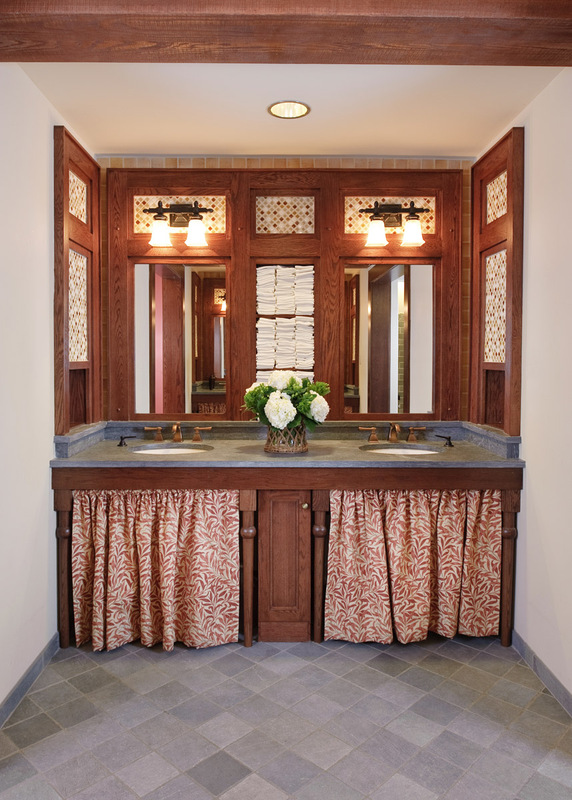 Rich materials such as mahogany café windows, a Jerusalem limestone entry wall, and a wooden bowl for Jewish ritual hand washing reflect authenticity and craftsmanship. These elements also incorporate sustainability features, utilizing low-flow plumbing technology and sustainable forestry practices. In addition to these materials, the wood flooring throughout is rapidly renewable strand woven bamboo, a material that supports clients the environmental initiative as well as providing a warm, elegant and practical flooring solution. An illuminated acrylic panel is located at the central entrance. Inscribed with Hebrew text, this panel captures the essence of the Hillel mission – “Shalom”, meaning peace, completeness, welfare and greetings of welcome. The vibrant colors, textures, materials and furnishings enhance the beauty of sharing through collaboration and celebration of community. Additionally, an elevated terrace provides a place for social interaction and soaking in the natural beauty of the distant mountains. 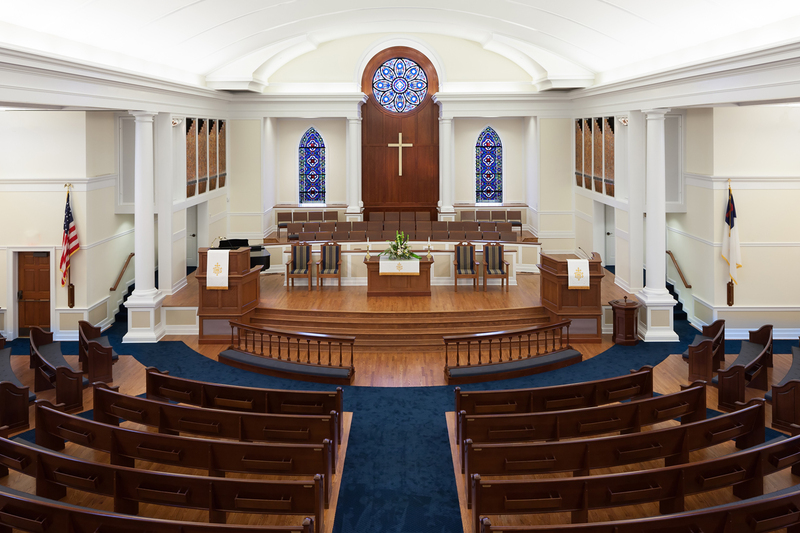 We are pleased to announce that our Interior Design Studio has received Honorable Mention in the Institutional category of the 2012 ASID IDEA Awards for their work at High Street United Methodist Church. Having outgrown their previous location, High Street United Method Church (HSUMC) of Franklin, Virginia wished to create a space that functioned as a community center and a welcoming place of worship. The new building speaks to the congregation’s long history in downtown Franklin while celebrating their hope in the future. HSUMC commissioned Bruce Wardell Architects (BRWA), of Charlottesville, Virginia, to design a new church for them following a generous donation from a member of their congregation – and BRWA invited our firm’s Interior Design studio to help integrate the elements of unity, hope, history and community throughout the churches interiors and furnishings. Seeking to provide a space that could provide community stewardship, the design team used traditional materials and forms in a contemporary way to broaden the churches audience, extend its range of services and support the church’s values. Capitalizing on the re-use of some of the church’s historical elements, including some of the light fixtures and stained-glass windows, finish materials were selected that spoke to the rich history of the congregation as part of the Franklin community. The new facility provides state of the art media and technical resources and generous room for growth as part of the church’s message of hope and commitment to the future. The National Terrazzo & Mosaic Association is pleased to announce the winners of the 2012 Honors Award. 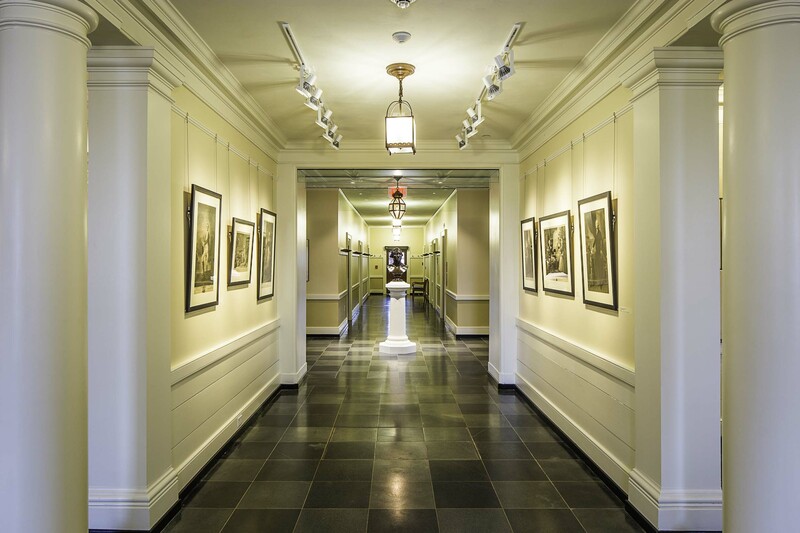 Among the winners is the Mary Brock Forbes Hall at Christopher Newport University. The award was presented to David Russell of Tile & Terrazzo, LLC, the contractor who completed the work. Please see the attached press release for a complete list of winners. The Virginia Tech Visitors & Undergraduate Admissions Center has been awarded LEED® Certification, established by the U.S. Green Building Council and verified by the Green Building Certification Institute (GBCI). LEED is the nation’s preeminent program for the design, construction and operation of high performance green buildings. As the gateway to the campus, the new 21,690 square foot Visitors & Undergraduate Admissions Center is a “signature building” for Virginia Tech. 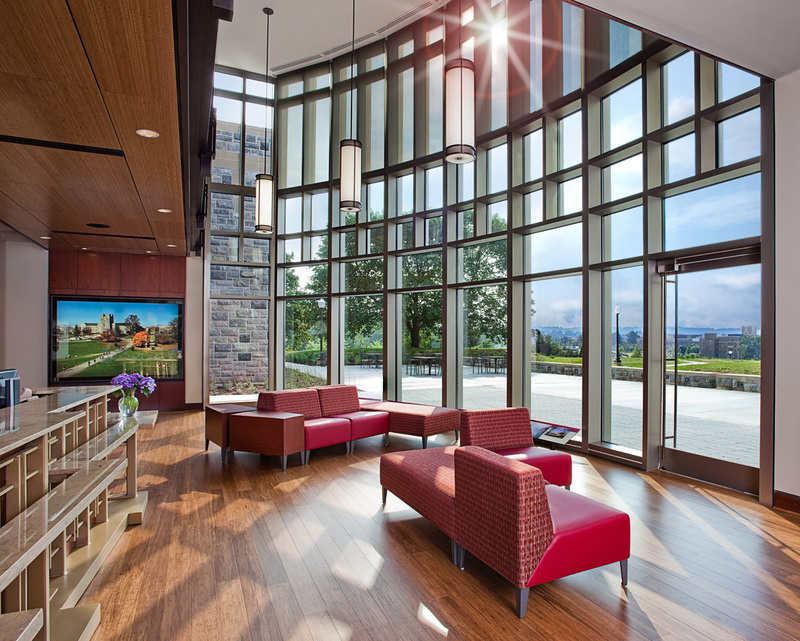 The architecture of the Visitors & Undergraduate Admissions Center combines elements of the traditional Collegiate Gothic with more contemporary interpretations, which integrates the building with the core campus. The Visitors Center presents an exhilarating view from an airy reception space through large glazed openings in a setting that is welcoming and accessible to the user. 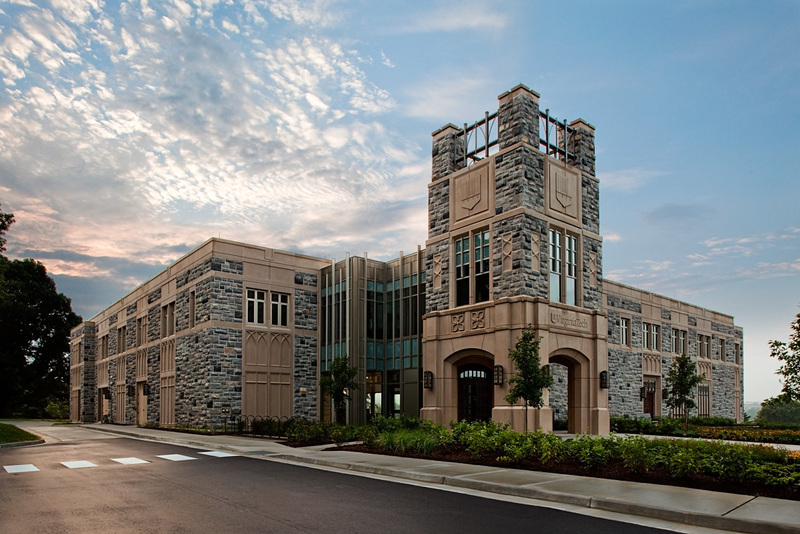 The Center is a two-story building, clad in Hokie Stone, that includes a visitor reception area, exhibit gallery, assembly hall, conference rooms, and staff offices. 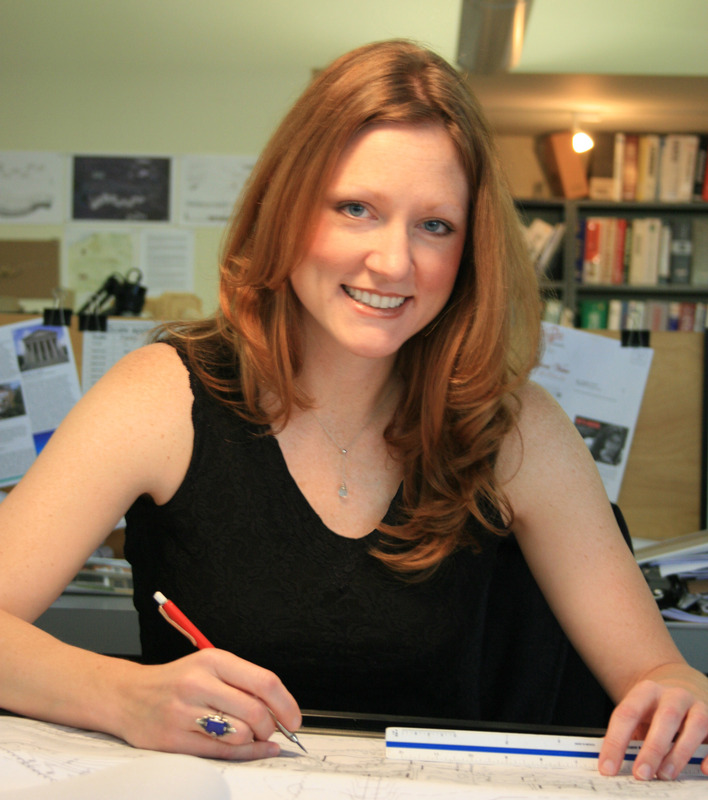 Interior Design Studio member Vanessa Vinsant is now a Certified Interior Designer in the Commonwealth of Virginia with the Board for Architects, Professional Engineers, Land Surveyors, Certified Interior Designers and Landscape Architects. Great job, Vanessa! Richmond, Va. (September 26, 2011) – Glavé & Holmes Architecture received five IDEA awards from the American Society of Interior Designers/International Interior Design Association Virginia/West Virginia Chapter at the September Design Awards Gala. 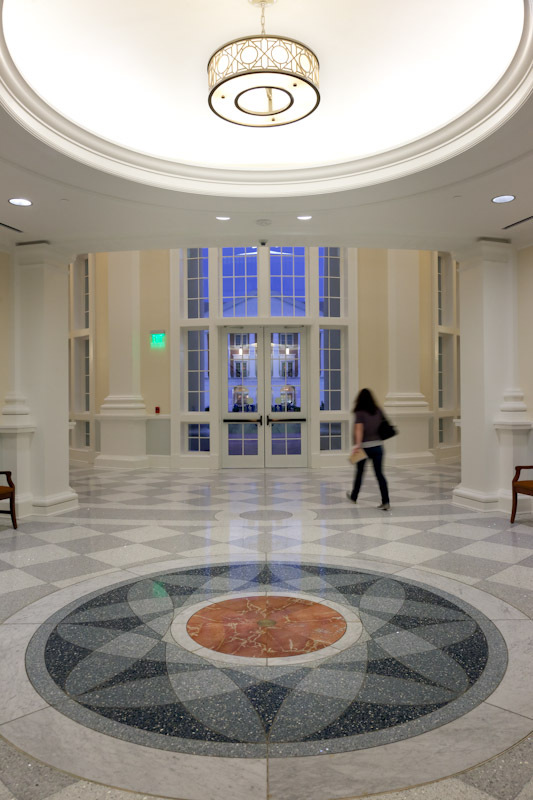 The awards included four IDEA Interior Design Excellence Awards and the “Brightest IDEA” Award for the Lewis Archer McMurran, Jr. Hall at Christopher Newport University. The Brightest IDEA award recognizes a project that illustrates the pinnacle of innovative design. Founded in 1965, the award-winning Glavé & Holmes Architecture specializes in cultural, higher education, hospitality/residential, interior design, and urban architecture projects. Glavé & Holmes Architecture believes that the creation of successful, context-responsive projects requires a collaborative process involving a well-structured design team, the client, the community, and other constituencies. From the firm’s inception, this principle has guided its work, resulting in exceptional service to diverse clientele.